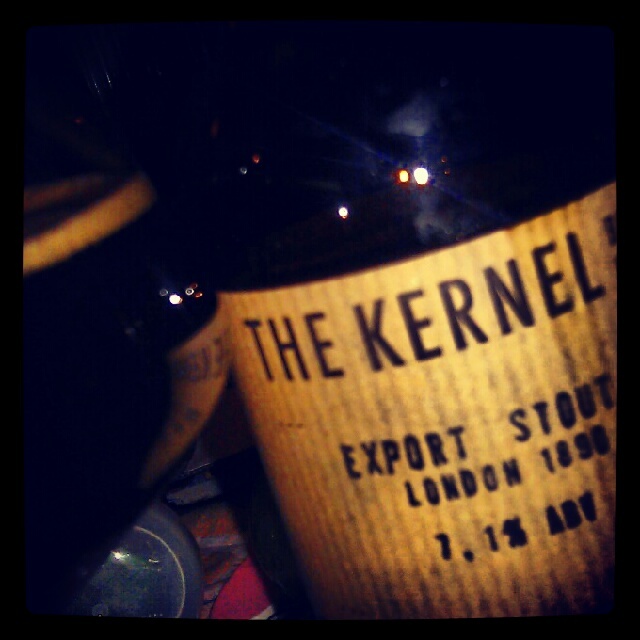 The Kernel – where have you been all my life!? How could I have missed this brewery? As a bit of a social media tart, I’ve seen quite a few people chucking back a bit of the Kernal’s special sauce on Untappd and Instagram. I’ve been fairly intrigued since everybody seems to think quite highly of them but for some sad reason, although we’re not far from London, there’s only one place I know of stocking these beers and they don’t have the Export Stout London 1890 (7.1%ABV) which I’d heard so much about. This made me such a sad panda that I brought one all the way back from The Bottle in York on the aeroplane and winding down from my trek around Salisbury seemed like just the right excuse to get it open. The Kernel are proud to say their beer is ‘bottled alive’ so it can grow and develop in the bottle. This little monster was kicking and screaming when we let it out; even though the bottle was sitting in the kitchen for a week since we bought it we got a little bit of a spray. Maybe it was all that beautiful flavour waiting to burst out. In appearance it’s everything I would want in a porter – total opaque darkness, the alcohol evident in the slight oiliness on the sides of the glass as I swirl it around. The aroma is outstanding rich, dark chocolatey malt. The taste is all this and more. Rich, thick mouthfeel with bitter espresso and sour red berries. A bite of decadent dark chocolate is lifted with a touch of vanilla. Perfectly balanced. Why is it called ‘Export’ anyway? I want it for myself!